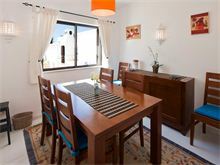 Casa da Esquina is just 1km from the centre of Carvoeiro making it an ideal villa for those who prefer to walk out in the evening rather than rely on your hire car. With its totally walled pool terrace and a built in barbecue with stone table and bench seating, it is also great for evenings in. The village centre is about a 10 minute walk down hill, which means it is up hill on the way back, however there is always a cheap and plentiful supply of taxis in the town square, should you not fancy the walk home! Carvoeiro beach is also within reach by foot making this villa a good choice for families with independent teenagers who like to explore on their own! Situated opposite L'Orange restaurant on the Colina Azul development Casa da Esquina has the bonus of bath or shower room for each bedroom and a heatable pool for the cooler seasons making it ideal all year round. 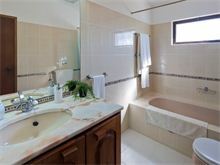 The interior is comfortably furnished with satellite TV and a modern kitchen complete with dishwasher. 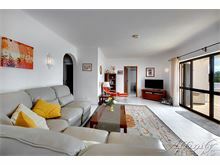 This villa is semi-detached, however the walled terrace ensures privacy and will provide a fantastic holiday. 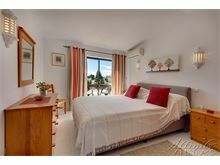 Approximately 1 km from the centre of Carvoeiro and the beach. Front door reached via steep driveway, entrance is into a hall, off which is a guest cloakroom, sitting room with wood burning stove, satellite TV, DVD and CD, arch to dining area and French windows lead to a covered terrace overlooking the pool. 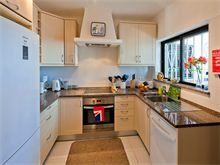 Modern kitchen with dishwasher, microwave and separate laundry area, 1 twin bedroom with full bathroom en suite. Stairs lead from the hall to 1 twin bedroom with small balcony and sea views, 1 shower room, 1 double bedroom with with small balcony and sea views and shower room en suite. 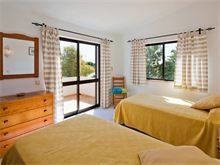 Air conditioning (bedrooms only) and pool heating are available at extra cost if required. Maid service 3 times per week. Car recommended. 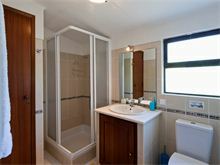 Casa da Esquina offers first class accommodation. Our holiday was enhanced as a result of the comfort and homelessness it provided. 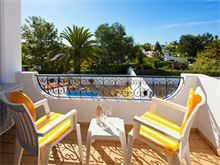 It is set in a quiet location about 15 minute walk (downhill) into the resort centre where you will find a range of bars shops and restaurants to suit all tastes. The walk back to the villa is uphill and challenging, a taxi is about 5 Euros. There are two excellent restaurants close to the villa. Nearest supermarket is in the resort. Nearest hypermarket (Intermarche) is a ten minute drive away. For those who like to shop, there is a retail outlet and mainline shopping available in Portimao. Bus is 3 euro or a taxi 15 euro. 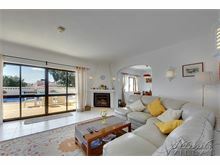 This villa is an excellent base for your holiday in Carvoeiro. I would highly recommend it. Wonderful week - none of us wanted to come home! The house was brilliantly equipped and very comfortable. Very very enjoyable and all involved were helpful and accommodating. Thank you! The villa was excellent. It was very well equipped and very clean and tidy. When we arrived the house manager and maid were on site and were very helpful in assisting us with where things were and how to operate the equipment. The location was just outside the town centre, and there was a fairly steep hill to walk down to get to the restaurants and bars. The town itself was vibrant and catered for all of our needs. Overall the holiday was excellent and I would have no hesitation in returning or recommending it to others. 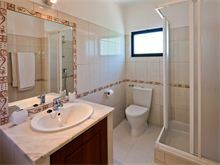 Lovely villa, fully equipped and a good open plan layout, great pool and the enclosed garden made it very easy to keep track of our 2 year old granddaughter. The location is perfect, we could have walked into town but the taxi was only 5 to 7 euros so we didn't bother. The restaurant opposite the villa was so lovely we ate there twice, but booking is advisable. We would definitely stay in this villa again.